A new report released in the journal Nature examines never before seen self-medicating behavior in Galápagos Finches. 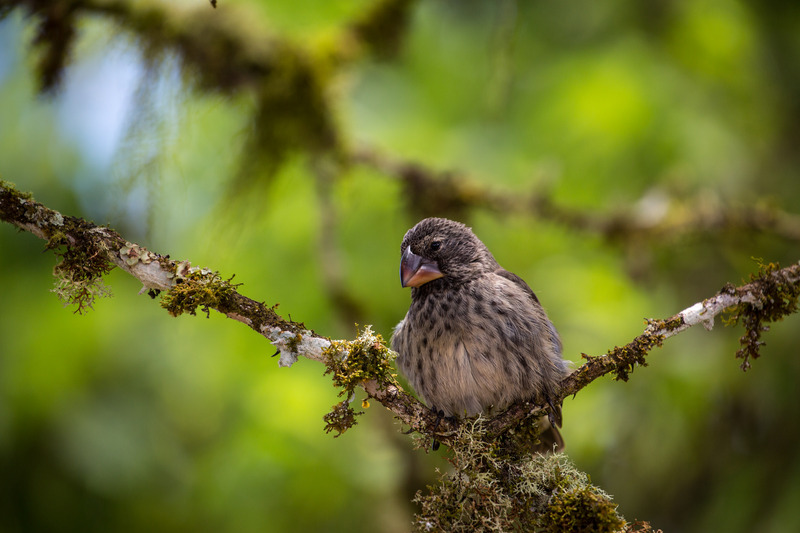 Galápagos Finches served as inspiration for Charles Darwin’s theory of evolution in the 19th century. Today, these iconic birds, commonly referred to as “Darwin’s finches”, have drawn the attention of scientists once again–but this time it’s not because of the size and shape of their beaks. Researchers studying Galápagos Finches on Santa Cruz Island, Galápagos just released a paper in Nature reporting an observation that is extremely rare in the animal kingdom: it appears that these distinctive birds are self-medicating. 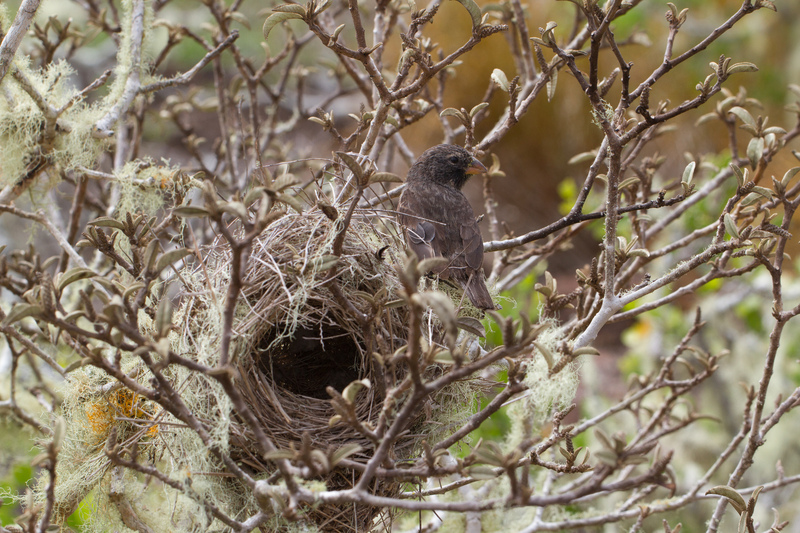 Over the course of four years, researchers observed Galápagos Finches rubbing leaves from the endemic plant P. galapageium, or Galápagos Guava, on their feathers. The birds use two methods: they either thread a piece of leaf through their feathers or chew up the leaf and then apply the mash to their feathers. Open Psidium galapageium stand. © 2006 – Frank Bungartz, Charles Darwin Foundation. Licensed under Creative Commons. While it is not uncommon for birds to rub arthropods (often ants) on their feathers, the use of plants is rarely seen. Reports of birds applying plants to their feathers are rare; only a few instances have been recorded. If you’re wondering why these birds are self-medicating, you’re not alone. The researchers grappled with the same question. After careful observations on Santa Cruz Island and in laboratory experiments, they have drawn a link between the unprecedented self-medicating behavior and the presence of invasive disease-bearing insects to the Galápagos. It turns out that recently introduced invasive mosquitoes and flies carry pathogens that are harmful to birds. 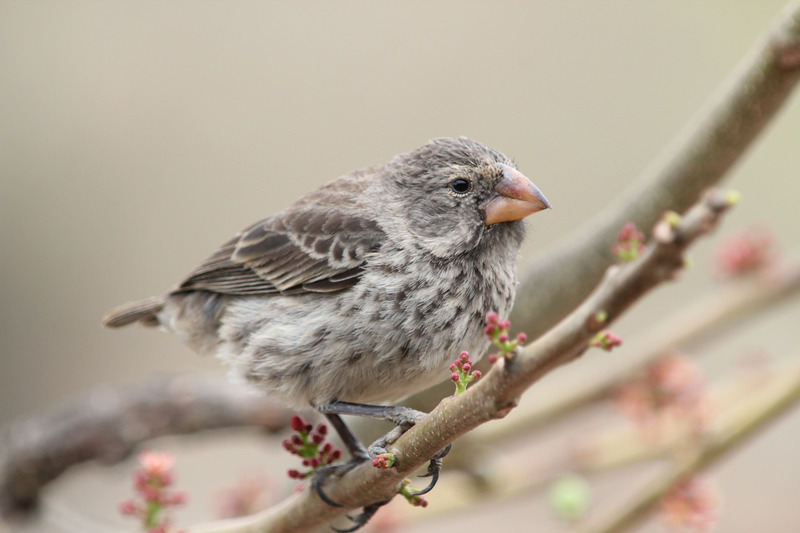 The researchers confirmed the presence of larvae of P. downsi, a parasitic invasive fly, in some of the nests of Darwin’s Finches. P. downsi is particularly detrimental to the finches’ reproduction. Invasive mosquitoes sometimes carry avian pox, which is also harmful to the native birds. The researchers designed laboratory experiments to better understand the effects of Galápagos Guava leaves on invasive mosquitoes. The experiments revealed that the Galápagos Guava does not kill the mosquitoes, but it does deter them–that is, the plant is considered to be repellent rather than insecticidal. The plant also inhibited growth of P. downsi larvae. 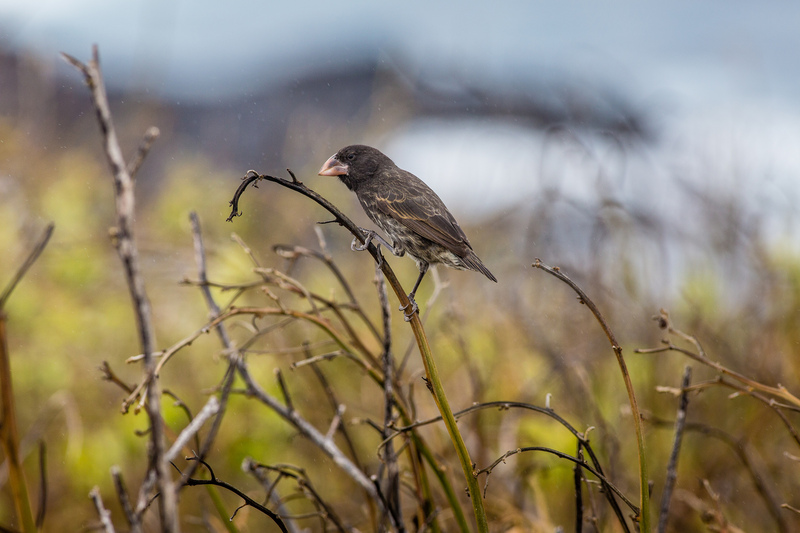 These findings suggest that Darwin’s finches are using Galápagos Guava as a preventive measure to protect themselves from the invasive mosquitoes. However, for official confirmation, more research is needed. 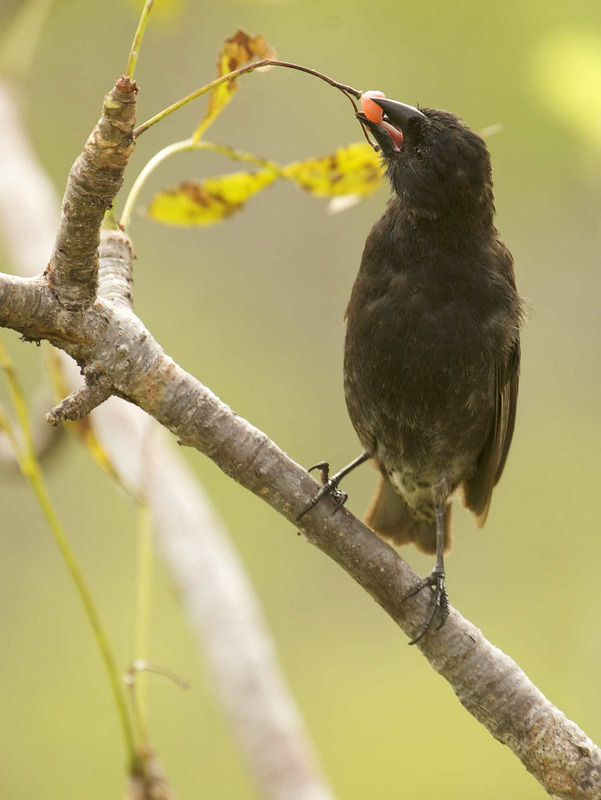 Yet another example of exceptional behavioural flexibility and innovation in Darwin’s Finches. 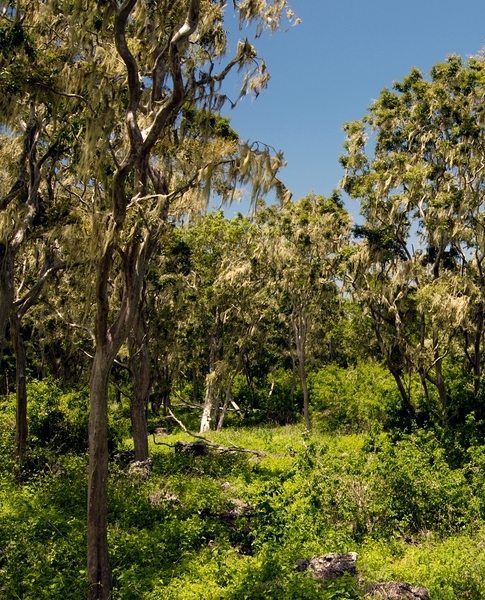 The identification of the active compounds of P. galapageium might serve as a basis for developing a novel plant-based repellent. Galápagos Finch foraging. Credit: BRJ INC.
We have much to learn from highly adaptive species such as those that live on islands. Who would have guessed that these birds’ beaks would inform Darwin’s Theory of Evolution, and how could we have known they would then help us understand tool-use and plant properties? 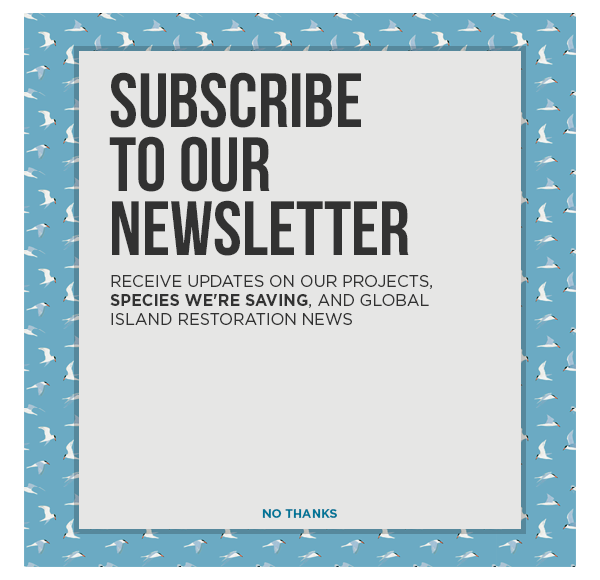 Darwin’s Finches and other island species are likely to continue to offer opportunities for novel research, raising ever more questions and inspiring new ideas about the natural world. Featured photo: Galápagos Finch. Credit: BRJ INC.